There are a lot of metaphors woven into You Will Remember Me, a beautiful play about early-onset Alzheimer’s by Governor General’s Award-winning playwright Francois Archambault (translated by Bobby Theodore), now playing at Tarragon Theatre in a co-production with Studio 180. This makes a lot of sense. Dementia, particularly in a family member, is hard to face or explain head-on; the gradual loss of everything that makes up a person we know is difficult to bear. The play is richly written, thematically resonant, and well-constructed. It’s also funny, emotionally stunning, and deeply moving. Edouard (R.H. Thomson) is a professor proficient in the past, a pundit whose tirades on everything from the dumbing-down of humanity to the Quebec separatist movement have long delighted the airwaves. Now, however, he can remember what happened five hundred years ago, but not the last five minutes. After dealing with years of Edouard’s self-important attitude and student-chasing, his wife Madeleine (Nancy Palk) accompanies him for one last passionate television interview. Worn out beyond belief, she drops him off at daughter Isabelle’s (Kimwun Perehinec) house with vague promises to return. Emotionally distant reporter Isabelle needs to go to a different kind of disaster, and so responsibility for Edouard is passed down the line to her new, unemployed partner Patrick (Marc McGrinder), then Patrick’s teenaged daughter Berenice (Michela Cannon). Success here rests on a nuanced and versatile portrayal of the man behind the storm; a loss of dignity is only tragic if it exists to begin with. R.H. Thomson’s powerful performance is all that — part abrasive (but charismatic) bluster, part frustration, part fear, and part need. He’s a curmudgeon, but with a youthful vitality, making his predicament even more heartbreaking. Who knows how long the body might be around without the mind? The show manages to feel polished and frayed at the same time, no mean feat. It’s a balanced look into both the plight of the caregiver and the afflicted. Though a tantalizing dip into the family dynamic, there might be a little less repetition and more development of vibrant, unusual characters like Isabelle and Madeleine – their willingness to appear unsympathetic only increases our sympathies, helped by excellent performances by Palk and Perehinec. Mostly, the writing soars, particularly when Edouard’s failing memory is merged with social commentary: we get a lesson in Quebecois history and the notion of a culture being replaced, the uncomfortable changes brought on by technology and our quick rate of absorbing but not retaining information, and even constant reminders of an invasive tree species. As a record itself, the play makes a case for recording the important moments, with Edouard’s memory notebook a pivotal prop. It serves as reminder, confessional and even living will. Memory is not the only thing shown to produce a fluid identity; the disease becomes a catalyst for self-exploration in everyone around it. Each character tests out a new self-concept, playacting, adopting false roles with each other, concealing identities. The ripples around the man at the centre are fascinating. Isabelle, lacking empathy and connection with her family or her interview subject, finds delight in a wine-fueled night with her father where she’s finally able to “live in the moment.” This is flipped cruelly, later, when we realize the tragic implication of living in the moment if that’s all you’re capable of doing: nothing else exists. Even the lovely set is fluid; it’s almost impressionistic, blurring the lines between nature and the family home and making good use of nature and technology-themed projections alike. The show’s emotional core comes from Edouard’s growing relationship with Berenice, an outsider to the situation, who initially treats him with exasperation and eye-rolling, but gains empathy as others lose it. Played beautifully with a growing brightness and compassion by Cannon, she goes from being the recipient of what might be Edouard’s worst insult, “incurious,” to the person who winds up inspiring and asking the toughest questions about loss and choice. It’s these questions that linger long into the night and beyond, and might keep you awake (particularly if you see it with spouse or family). Let’s just say it’s not an issue, or a play, you’ll forget. 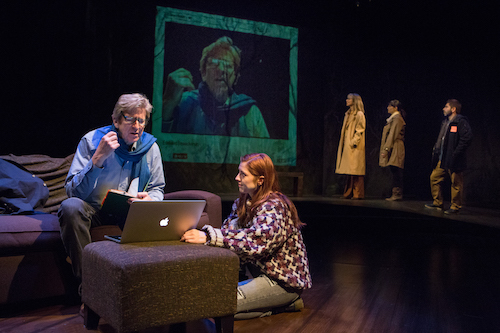 You Will Remember Me runs until April 10, 2016, at the Tarragon Theatre Mainspace (30 Bridgman Avenue). Shows are Tuesday-Saturday at 8:00PM; Sunday at 2:30PM; with select Saturdays, March 12, 19, 26 at 2:30PM. Regular Tickets range from $28 to $60 with discounts for seniors, students, groups and artsworkers, and can be purchased by calling Tarragon Patron Services at (416) 531-1827 or online. For every remaining performance, $15 Rush Tickets will be sold (subject to availability) in person at the Box Office two hours before show time.